Is there a better alternative to emesene? Is emesene really the best app in Chat category? Will emesene work good on macOS 10.13.4? Note: emesene is written in Python and uses the PyGTK toolkit to provide a GUI. For more information on this port see the emesene wiki. New in-development QQ backend and session through libwebqq (Xiang Wang). 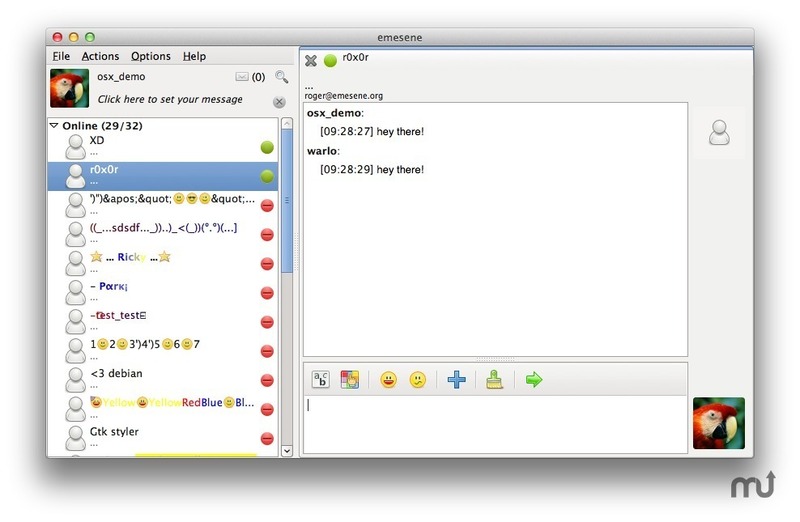 Updated SleekXMPP for XMPP backend. Fixed messages not being received or rendered with weird fonts. emesene needs a rating. Be the first to rate this app and get the discussion started! Added infrastructure for allowing plugins to hook into events (at the moment only send and receive message events are handled, we will add hooks on request) with priority lists. Added new options for exporting conversation history (now HTML, CSV, JSON, XML and TXT are supported). Fixed many, many, many bugs in the gtk gui and added a few new features. Better OSX experience (Josh Fradley). Improved Qt4 gui (not suitable for daily usable yet, development only). Improved plugins and themes updates.